Suddenly, the euro area is in turmoil. At the turn of the year, just about every investment manager was touting Europe as the place to be: give your portfolio a European vacation! There would be recovery. It already was looking strong, or at least solid. The ECB would soon be transitioning its policy, following the Fed back to normalcy. The euro area’s old problems were behind it. The German, French and Italian elections were concluded and Europe had survived. Spain was putting the toothpaste back in the tube after the Catalan secessionist crisis. Europe seemed to be on a multi-faceted upswing. But then reality intruded as it usually does. A sprinkle of pixie dust might keep the bad news a way for a while and superficial analysis that covers the warts with layers of makeup might help. But in the end, lipstick on a pig is just lipstick on a bunch of PIIGS. And in the EMU, the PIIGS are beginning to show their true colors (PIIGS: Portugal, Ireland, Italy, Greece, and Spain). And it is more than just this group of long-time trouble-makers. In Germany, Angela Merkel won her election but was so weakened after her position on migrants took its toll at the polls that she spent months forming a government; it is one she does not control as she did in the past. Now to get back to her more traditional roots, her government is placing its priority on fiscal probity, running a budget surplus, and planning to stiff the U.S. and the rest of NATO on its ‘promised’ 2% of GDP contribution. In France Macron won a decisive victory and the populist candidate Le Pen who was easily dispatched but France has little liking for Macron’s attempt to pull France into the 21st century with labor laws and he is suffering nationwide strikes as protests continue. Spain and Portugal have had their trying moments of unrest. Ireland has been quiet recently and instead has been making steadier economic progress. But Italy’s elections were a problem from the start. They were clearly a ticking time bomb that markets showed their sophistication toward by continuing to go about their business, ignoring them instead of discounting the bad that potentially (and actually) was brewing. In the end, even the formation of a rogue coalition government did not unsettle markets. It was not until the President who must approve the new arrangement rejected the proposed economy minister that events really unraveled. President Sergio Mattarella has tried to initiate the formation of a new government, but Carlo Cottarellli will not be able to form anything that will work. Italy’s coalition could reset itself or there could be new elections as soon as July. And in the event of new elections, will ‘leaving EU/EMU’ implicitly be on the Italian ballot? Away from all this political maneuvering, we have unfolding economic trends. And with all these layers of political intrigue, the EU indexes are showing some steady decay in economic conditions. What’s worse is that in the EMU fresh price data show that inflation in Spain, but more importantly in Germany, is rising to or above the EMU-wide threshold of 2%. So how is the ECB supposed to deal with this? The answer is as clear as it is disturbing. The ECB has only an inflation mandate and if something bad comes of trying to stuff rising inflation back into place the Germans and other hard money hawks will not take any blame but will blame other ECB council members for waiting to so long that it was finally presented with such an unpalatable choice. Two countries do not an EMU inflation rate make. But the EMU is moving closer to meeting its price objective and at a time when rate hiking would not be a desired action. The EU Commission indexes show that there is a widespread slowing now in gear and for now it does not seem very severe. With 17 of 19 members reporting May data, nine countries show weaker composite indexes for May. This compares with 10 last month and 14 the month before that. 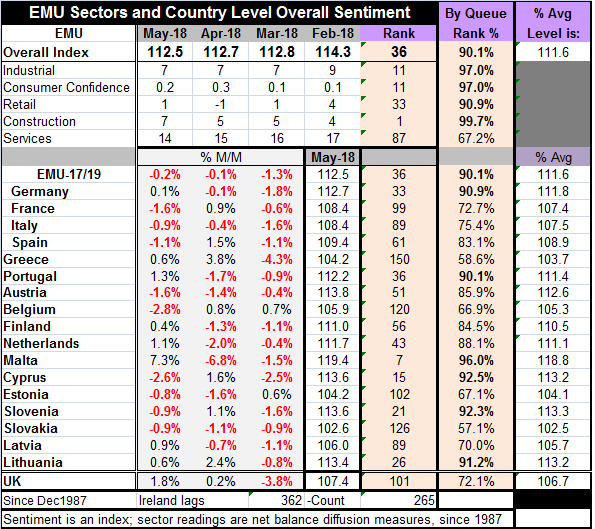 Clearly, there is a slowing in the EMU and clearly it is a widespread slowing. Rising inflation with slowing growth and local political turmoil that has spread to financial markets unrest is a bad concoction no matter how you mix it. The EU commission data show that the services sector is the weakest one; construction (a small sector) is the relative strongest and at its peak to boot. But the components for the EC indexes show weakening trends for the industrial sector as production expectations and the production trend both are lower. Consumer confidence has topped and expectations for the economic situation 12 months ahead have fallen steadily. Three of the four largest economies are losing retail confidence over 12 months. While Germany is an exception, it just today reported its first retail sales volume gain after five consecutive months of dropping. Services are losing momentum in three of the four largest countries; Spain is an exception. If the European economy is losing momentum, ‘chances are’ that inflation will stop rising and the ECB will be kept off the horns of this particular dilemma. Like the Fed, the ECB has a well-stocked bank vault full of months in which it has tolerated undershooting inflation. But it is not clear that that reservoir can be used for anything at all besides empty rhetoric if inflation really rises above the 2% threshold in Europe. Is this Europe’s day of ‘Wreckoning?’ Stay tuned.